To speed up the construction of the Dwarka-Gurgaon expressway, the highways authority has started acquiring 10 hectares in Delhi from private owners. A meeting in this regard was held on Wednesday and officials of the National Highways Authority of India (NHAI) discussed the transfer of land with Delhi officials. Most of the land required in Delhi is owned by the public works department (PWD), which has to transfer it to NHAI. Land for the Gurgaon side of the expressway has already been acquired and approximately 14 km of the 18 km in Gurgaon is ready. NHAI project Director Ashok Sharma said the Delhi government has agreed to transfer the land for the construction of the highway. “We have notified the land acquisition procedure and it is likely that the land will be acquired in the next six months. Apart from the road, the NHAI will also build roadside amenities and border posts for which to the land is needed,” he said. In a recent meeting, the Haryana Urban Development Authority (Huda) also assured the NHAI that all issues pertaining to rehabilitation of those ousted for the road will be resolved in the next four months. However, given the legal challenges being faced by Huda from land owners, it remains to be seen whether the authority would be able to deliver on this promise. In Gurgaon, the construction of Dwarka expressway is stuck as landowners approached the Punjab and Haryana high court in 2008 for rehabilitation. In May last year, the HC directed the government to give plots and compensation to the evictees in six to nine months. However, the Huda could not do this as there was no land available. Sharma said by the time the Huda transfers the road to them, they will prepare a detailed project report to complete the Delhi section. “We are committed to delivering the road,” he said. 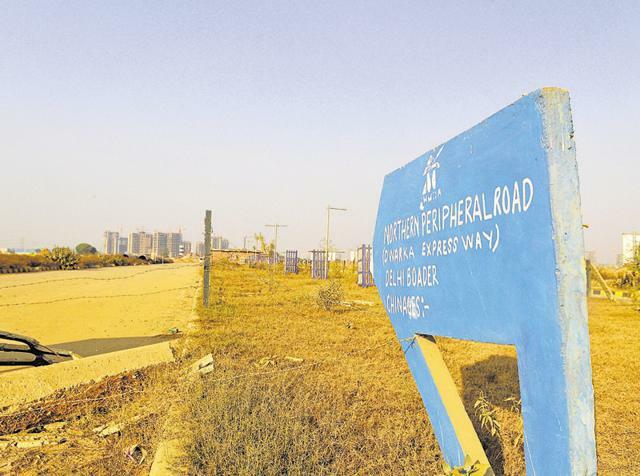 The proposed 150-metre wide Dwarka-Palam Vihar link or Northern Peripheral Road (NPR) connecting Dwarka and NH-8 in Gurgaon has envisaged 10 years ago and was to be ready before Commonwealth Games 2010. The road has already missed six deadlines.